How to edit PDF document? Usually I receive a PDF contract that I need to sign and send back online. I am wondering what is the easiest way to do so on computer, to avoid the hassle of print/sign/scan process? Xournal is a good interactive option to write on top of existing PDF. It supports digital pen or you can paste/import your signature. There are best tools available in Ubuntu for pdf editing like PDF-Shuffler, pdftk, inkscape. Visit this link for pdf editing in different scenarios. For your purpose an easy way I do it is using GIMP. You can import a pdf file (or one of its pages) into GIMP. It has native pdf support. You can then add your signature (either draw it or copy it from another file). This works nice for single page pdfs. For multiple page pdfs you can check how gimp handles them here. 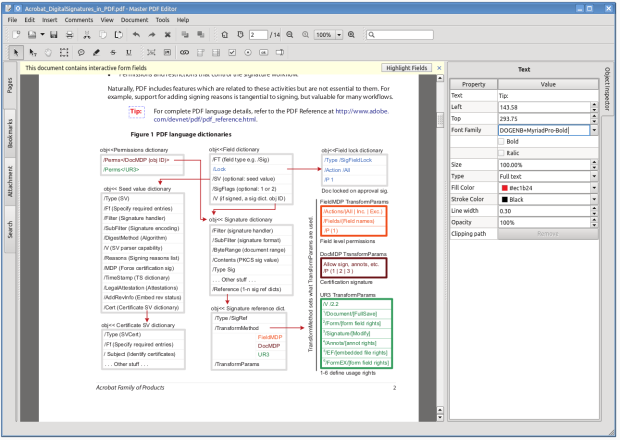 You could try installing Oracle PDF Import Extension in Libreoffice. You can find it here. Create new PDF and XPS files or edit existing ones. Add and/or edit bookmarks in PDF files. Encrypt and/or protect PDF files using 128 bit encryption. Convert XPS files into PDF. Add PDF controls (like buttons, checkboxes, lists, etc.) into your PDFs. Import/export PDF pages into common graphical formats including BMP, JPG, PNG, and TIFF. Signing PDF documents with digital signature, signatures creation and validation. Now use the dpkg command to install Master PDF editor Debian package. Not the answer you're looking for? Browse other questions tagged pdf document or ask your own question. Very heavy .PDF file. How to handle it? How do I type text on top of a PDF?